Lawyers must act ethically 24/7. That is, we are held to a consistent standard of integrity that exceeds mere adherence to professional norms in our legal lives. We are also expected to behave ethically in our private business affairs. When that does not happen, judicial authorities have repeatedly, and sometimes severely, disciplined lawyers for peccadilloes that have nothing to do with the practice of law. In a previous article,1 Rick Supple and I described in some detail the statutory and regulatory framework that empowers the Appellate Divisions, and the disciplinary agencies that serve them, to sanction private conduct. Principally, New York Judiciary Law §90(4) provides that any New York lawyer convicted of a New York State felony or an analog crime in another jurisdiction is automatically disbarred,2 and any lawyer who commits a “serious crime,” as defined in the statute, is subject to professional discipline whether or not the conviction has anything to do with the attorney’s law practice.3 “Serious crime” convictions generally result in public discipline, including even disbarment, following a hearing solely concerning sanction. Should lawyers be subject to professional discipline, in addition to criminal, civil, or marketplace penalties, for acts that do not relate to the practice of law? If so, where should the line be drawn? Post your comment at the end of this article. Two related questions arise in connection with the above cases. The first is fundamental: Why should lawyers be subject to any professional discipline, in addition to criminal, civil, or marketplace penalties, for acts that do not relate to the practice of law? And second, if professional discipline is warranted in such circumstances, then where should the line be drawn regarding private conduct properly subject to scrutiny by disciplinary authorities, as opposed to personal behavior that falls below recognized moral or ethical standards but nonetheless lies within a zone of privacy? The answer to the first question is simply the fact that lawyers, as “officers of the court,” have a duty to uphold the law at all times. Attorneys who engage in illegal or dishonest conduct reflect adversely on the integrity of the legal profession, and the reputation of the bar in the eyes of the public is something the bar and the judiciary legitimately strive to protect. Maintaining that good reputation is an obligation which comes with the privilege to practice law. 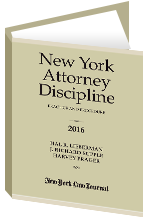 Reprinted with permission from the February 19, 2013 edition of the New York Law Journal ©2013 ALM Media Properties, LLC. All rights reserved. Further duplication without permission is prohibited. For information, contact 877-257-3382 – reprints@alm.com or visit www.almreprints.com. Hal R. Lieberman and Richard Supple, “Private Conduct and Professional Discipline,” NYLJ, July 23, 2002. See, e.g., Matter of Silberman, 83 AD3d 95 (1st Dept. 2011) (six-year suspension for possessing and engaging in distribution of illegal narcotics); Matter of Goldman, 71 AD3d 9 (1st Dept. 2009) (one-year suspension for attorney who pleaded guilty to one count of failing to file New York State tax return, where attorney failed to file both state and federal tax returns for seven years); Matter of Clarey, 55 A.D.3d 209 (2d Dept. 2008) (one-year suspension for attorney who pleaded guilty to operating a motor vehicle under the influence of alcohol and leaving the scene of an accident); Matter of Felsen, 40 A.D.3d 1257 (3d Dept. 2007) (lawyer disbarred after being convicted out of state of forging a physician’s signature to a prescription form in the name of a fictitious person in order to obtain a pain killer at a pharmacy; Matter of Ugweches, 69 AD3d 125 (1st Dept. 2009) (attorney automatically disbarred upon his conviction for the class D felony of second-degree assault). A lawyer should be temperate and dignified, and should refrain from all illegal and morally reprehensible conduct. Because of the lawyer’s position in society, even minor violations of law by a lawyer may tend to lessen public confidence in the legal profession. …Although a lawyer is personally answerable to the entire criminal law, a lawyer should be professionally answerable only for illegal conduct that indicates lack of those characteristics relevant to law practice. Violations involving violence, dishonesty, fraud, breach of trust, or serious interference with the administration of justice are illustrative of illegal conduct that reflects adversely on fitness to practice law. Other types of illegal conduct may or may not fall into that category, depending upon the particular circumstances. Although COSAC believes there is some illegal conduct that does not reflect adversely on a lawyer’s honesty, trustworthiness or fitness as a lawyer, there is an argument, as presented in the former EC, that even minor transgressions may tend to lessen public confidence in the legal profession and thereby draw into question a lawyer’s fitness as a lawyer. Many kinds of illegal conduct reflect adversely on fitness to practice law. Illegal conduct involving violence, dishonesty, fraud, breach of trust, or serious interference with the administration of justice is illustrative of conduct that reflects adversely on fitness to practice law. A pattern of repeated offenses, even ones of minor significance when considered separately, can indicate indifference to legal obligation. In re Dear, 91 A.D.3d 111 (1st Dept. 2011) (six-month suspension). In re Sibley, 61 A.D.3d 85 (4th Dept. 2009) (imposition of reciprocal discipline upon attorney suspended in Florida for three years). Matter of Gurvey, —N.Y.S.2d—, 2012 WL 6013093 (1st Dept. 2012) (six-month suspension; although the court acknowledged that respondent was not acting as an attorney at the time of the subject misconduct, it affirmed that it has “disciplined attorneys for conduct that is ‘both in and out of their profession so as to ensure the public’s right to representation by attorneys who are worthy of trust'”). In re Solny, 96 A.D.3d 76 (1st Dept. 2012) (two-year suspension although respondent was not acting in his professional capacity as an attorney, but rather as the coexecutor of his uncle’s will). In re Bikman, 304 A.D.2d 162 (1st Dept. 2003) (18-month suspension; court noted that “[e]ven if respondent did not quite manage to commit criminal or common-law fraud, she surely was dishonest, she was deceitful and she did misrepresent,” and “a lawyer’s unethical conduct, even when it occurs outside the practice of law, is a proper concern of the Disciplinary Committee because it tends to reflect adversely on the legal profession as a whole”). Lieberman and Supple, supra note 1. Thus, in our view, for example, dishonesty in applying for a mortgage or financial aid will likely be subject to discipline, whereas marital infidelity—however one views it from a moral perspective—falls within a zone of privacy that should be out of bounds for disciplinary agencies.